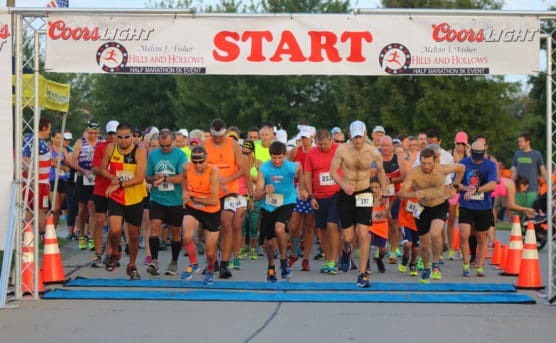 This is a race that certainly lives up to its name, as Valmeyer’s Hills and Hollows Half Marathon & 5K takes runners on a course that varies between relatively flat straightaway stretches and some seriously challenging uphill stretches, especially in the last few miles of the race. From the starting line on the edge of town on Route 156, this out-and-back race follows a clockwise loop course through the “hills and hollows” of the countryside just outside Valmeyer, and features nearly 500 feet of elevation change over the course of the run. Just over 200 runners crossed the finish line at the race’s 2011 running, including 110 finishers in the half marathon alone. Dedicated to the memory of local resident Melvin J. Fisher, a longtime member of the Valmeyer Volunteer Fire Department who helped grow and modernize the department for many years, the race starts at the corner of Route 156 and South Valmeyer Avenue, at an elevation of about 846 feet above sea level. From there, the course takes runners southward along Route C and Deer Hill Road, with a number of turns along the way. 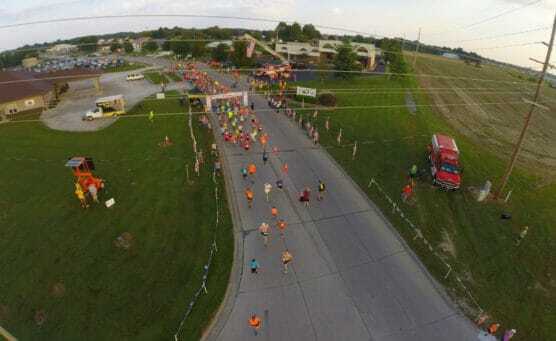 When it reaches Madonnaville at KK Road, the course turns westward and heads toward Monroe City. After Monroe City, the course begins a long, steady descent toward its lowest elevation as it runs along the Mississippi River bottoms areas along the edge of the hills, turning northward off KK Road onto Bluff Road. The next four miles are all northward along Bluff Road, toward the turn at Mitchell & Main Street, where the course begins its final — and steepest — hilly stretch over the last two miles to the finish line. You’ll no doubt notice as you run the race, especially during its second half, that much of the course takes runners through the Mississippi River floodplain. What you’re running through are nearly totally rebuilt communities, as much of the area was wiped away 15 years ago when the river overflowed its banks in the great flood of 1993. Ever since then, the town of Valmeyer has been rebuilt — on a site about two miles east of its original location, and 400 feet higher in elevation. What you’ll see when you visit Valmeyer for the race is a town built totally anew, restored to life thanks to the help of a mix of federal, state and local funding and assistance. Located in the southwestern corner of the state, in Illinois’ westernmost bend of the Mississippi River just across the border from Missouri, the small town of Valmeyer typically sees mild to moderately warm weather in early fall, with the occasional shower. On the day of the race (Sept. 22), the average low is 56°F and the average high is 78°F. See the Hills and Hollows Half Marathon course map here. To reserve your spot in the 2018 running of Valmeyer’s Hills and Hollows Half Marathon or 5K race, register online at RunSignUp.com here. Ever run in the Hills and Hollows Half Marathon? Share your impressions here, or post your review in the Comments box below. Please update our event date September 23, 2017. Did you get the pictures I sent to you? Hi Marvin! My apologies on taking so long — I’ve received your photos and posted the update above. Please let me know if you have any further updates!